Wellington, FL – March 22, 2014 – The sun rose over Deeridge Farms as trailers and cars rolled through the opened gateway and down the winding path lined with beautifully manicured banyan and royal palm trees. The fog lifted from the grand prix field to reveal the course that would challenge over 50 horses for the $24,950 Wellington Turf Tour Invitational Grand Prix Finale. Today it was Ainsley Vince of Canada who dominated the field, riding to the top of the leader board three seconds ahead of her competitors, stopping the clock in 34.676 seconds, proving untouchable. Eric Hasbrouck set the track for today, using a liverpool, triple bar, oxer-oxer double combination, a triple combination and a skinny vertical, which proved to be the bogey fence of the class with 12 pairs finding fault at the final fence. Sandra Dalman was the first rider of the day to master the first round course and move into the jump off. She piloted Brightside to the time of 40.614 seconds, but the pair incurred eight faults for two fallen rails. They showed the path to take, and Cristoph Schroeder was ready to take on the challenge. Schroeder gathered his reins and easily maneuvered through the first course. As the buzzer sounded, he picked up a strong gallop and took his aim at the top. He crossed the finish in 38.493 seconds with Catungee, taking the lead and setting the time to beat. Jeffery Welles and Bilion, the pair that set the series on fire with multiple victories throughout the 11 weeks, were the next to post a double clear effort. Although they have become the speed demons of the 2014 Wellington Turf Tour, they fell 5/10ths of a second behind Schroeder, stopping the clock in 38.970 seconds. It wasn’t until Roger Pellerano and Precious Platiere tackled the short track that defeat seemed plausible. He raced around the jump off course with astonishing speed, taking the inside turns and shaving the seconds to finish in 37.387 seconds. He was a full second faster than Schroeder, and as the rails continued to fall as contenders attempted to best his time, victory seemed within reach. Ainsley Vince rose to the challenge with Frieda, finessing the first round and dazzling onlookers with her inside track during the jump off. She had her sights set on the win, making almost every inside turn, and slicing to the obstacles in an effort to shave the seconds. Her plan proved successful as she soared over the final skinny vertical and broke the beam in 34.676 seconds, a full three seconds quicker than the rest of the field. Vince has been riding Frieda, owned by the KMA Group, since she was a 5-year-old. The now 13-year-old mare knows her rider well, and their understanding was apparent on the turf. Vince’s dash for the cash held solid as each consecutive rider attempted to catch her blazing speed, but her time was unstoppable. Her fate was sealed at the pinnacle of the ranks, taking home the lion’s share of the earnings. The day concluded with Darrin Dilin and Landsdowne taking fifth, and Emanuel Andrade aboard Crossfire 10 finish sixth. Dilin also captured the seventh place position with Ariana, while Schroeder and Diamant Du Revel rounded out the top eight. Jeffery Welles was named the 2014 Wellington Turf Tour Leading Rider, winning the highly coveted $35,000 International Polo Club Palm Beach year membership, as well as a branding package from PoloGear. Sarah Segal was awarded the runner-up award for her placings in the ranks, winning a one-of-a-kind Beverly Bryant Portrait. Today concluded the 11-week series of the 2014 Wellington Turf Tour, but the Ridge at Wellington has more in store for riders in the upcoming weeks. Friday, March 28, riders will have the opportunity to compete in the second Classic Day to take place at the Ridge at Wellington. The Child/Adult Jumper division will run in the sand ring from 8 a.m. until noon, with a Masters Jumping Section. The Masters Jumper division, open to riders age 50 and over, will run concurrently, including a Child/Adult Jumper Section. The Junior/Amateur-Owner Classic will commence at 12:30 p.m. and run until 4 p.m. Classes will run as an open gate beginning and concluding at the times scheduled. The gate will be open; however, times may be obtained by request. To request and confirm a specific start time for a horse/rider combination the show office many be contacted directly at (561) 791-1471. 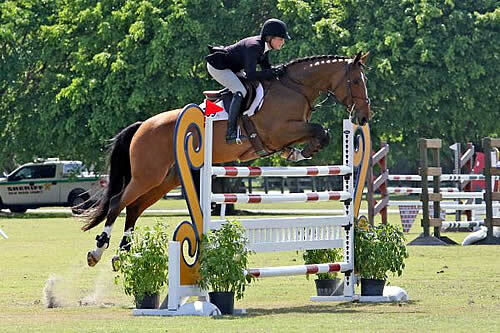 The Ridge at Wellington will also host their final schooling show April 4-5, 2014. The show is the final opportunity for riders to compete for double points. Young Jumper Championship (YJC) Class Finals Wednesday, March 19, 2014. Junior/Amateur-Owner, Child/Adult and Senior Jumper Classics will find their home intermittently throughout the Wellington Turf Tour. Peter Wylde and Smoking Gun on their way to the win in today’s $15,000 USHJA International Hunter Derby. 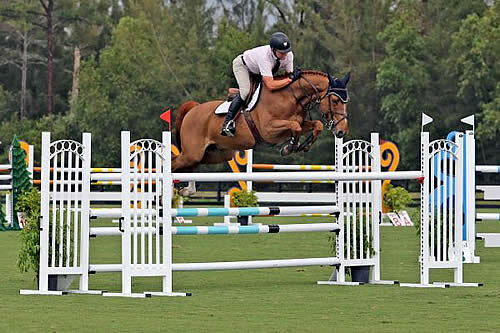 Wellington, FL – March 21, 2014 – Peter Wylde has racked up quite an impressive list of accomplishments – including winning Olympic gold – but prior to today there was one thing that he had never attempted: a USHJA International Hunter Derby. Today, the veteran show jumper not only rode in his first International Hunter Derby, he dominated it, earning the win aboard Smoking Gun in The Ridge at Wellington $15,000 USHJA International Hunter Derby. Prior to leading the victory gallop across The Ridge at Wellington’s picturesque grass field, Wylde and Smoking Gun had to best an extremely competitive field of 36 horses over two rounds of competition. Following the first, classic hunter round of competition, the top 12 horse and rider combinations returned in reverse order of their rankings for the second round of competition. Making the biggest jump from the first round to the second round were Kelley Farmer and one of her multiple talented mounts in today’s class, So to Speak. The pair returned in the tenth place position, but after electing to take two of the high option fences, Farmer racked up the points from the judges for second round scores of 89 and 90 plus handiness points of six and five for a cumulative, two round total of 361. That score would eventually land them in the overall fourth place position. Returning in the third place position following the first round, Wylde knew he had to make up a little bit of ground if he wanted a shot at the win. Fortunately, he also knew he had just the horse to do it. “That horse is so scopey. He can jump anything, so it’s fun to do,” Wylde said. Wylde used that scope to his advantage, as Smoking Gun was one of only two horses to take all four high option fences. The two judging panels agreed. They awarded Wylde scores of 87.5 and 86 with handiness scores of six across the board. Those points combined with the four high option fences would give Wylde a cumulative, two round total of 371.75. Returning in the second place spot it was again Farmer, this time on Larry Glefke’s Point Being. Farmer was the only other rider to elect to take all four of the high option fences, but she would finish just behind Wylde and Smoking Gun with a cumulative total of 369. Kate Conover and Jessica Stitt’s Taken finished in first place in the first round, but elected to forego any of the high options, landing them in third place spot overall. Following his successful experience at The Ridge, Wylde is eager to point Smoking Gun at other hunter derbies in the near future. Earlier in the day, another mount made his hunter derby debut in similar winning style: Marigot Bay Farm LLC’s Solo, ridden by Shawn Casady. Casady and the 6-year-old Oldenburg gelding bested a field of 22 horses to secure the victory. “He’s young, but he has such a natural jump,” Casady said of Solo, who is currently competing in the Pre-Green Hunters. Watching Solo’s two rounds in the ring at The Ridge at Wellington, he looked like a veteran well beyond his Pre-Green years, turning in two seamless trips. Finishing in second behind Casady and Solo were Hayley Barnhill and Laura Karet’s Caliber, while Michael Zukerman and Patricia Adikes-Hill’s Denmark rounded out the top three. Horse shows with The Ridge at Wellington continue tomorrow with the Wellington Turf Tour $24,950 Grand Prix Finale beginning at 8 a.m. at Deeridge Farm. Wellington, FL – March 19, 2014 – The final week of the Wellington Turf Tour kicked off today at Deeridge Farms. It was a heated competition, with some of the nation’s top riders, both professional and amateur, going neck to neck for the top awards in the 1.30m-1.35m Jumper classes and the YJC Finals. Jeffery Welles and Bilion once again rode to the top of the leader board in the first 1.30m-1.35m Jumpers, proving exactly why he sits at the pinnacle of the Wellington Turf Tour Leading Rider standings. Sarah Segal also put in a fantastic effort to win the second class of the day with Zelda, securing the victory by 1/10th of a second over Linda Sheridan and Invitational. It was a battle against the clock today, with over 50 horse and rider combinations racing for the win in the final 1.30m-1.35m Jumper classes at the Ridge at Wellington Turf Tour. Leslie Howard was the first rider to take on the track, riding two mounts to double clear efforts. Although her times were solid, Paul Halpern and Super G were on fire as they set the time to beat at 32.932 seconds. Christoph Schroeder rose to the challenge blazing through the course in a quick and tidy 32.241 seconds aboard Una Bella, returning with Diamant Du Revel to duplicate his effort in 32.696 seconds. Although Marie Hecart and Premier Platiere attempted to catch his time, their speed was not quite on point as they rode to a more conservative time of 33.891 seconds. Jeffery Welles returned to the turf today with the liver chestnut that proved he can do it all: Bilion. The gelding has consistently risen to the top of the ranks each week, only continuing to improve with the 11-week series and dominate the competition with Welles in the saddle. They picked up a strong gallop from the opening oxer, and continued to navigate the track efficiently. Although Bilion slightly backed off to obstacle 12, the pair rose to the challenge, making up time with an inside turn that shaved the second to a vertical. Their rollback to the final oxer sealed their fate as the victors, stopping the clock in 31.504 seconds. The second class of the day saw Sarah Segal ride to the first and third place finishes with Zelda and Tilghman, respectively. It was only a fraction of a second that separated Segal from Linda Sheridan’s time of 30.943 seconds aboard Invitational. Sheridan also rode Vantina HPF to the fifth place finish, only narrowly missing fourth place when Brittni Raflowitz and Elios tripped the timers in 31.839 seconds. Schroeder secured the fifth place finish with Diamant De Revel in 34.008 seconds, while Mario Deslauriers and Scout de la Cense rounded out the top six in 37.264 seconds. Mikala Chesler and Stanley Stone finished with the seventh place for their effort of 39.974 seconds set early in the day. Today concluded the YJC Qualifying Classes, offering three times the amount of earnings in each division. In the $1,500 7/8 Year Old YJC Qualifying Class, Mario Deslauriers and Peyton rode to the top. Candice King and Diamond of Picobello Z took second place, while Lucy Deslauriers and Hamlet finished in third place. It was a six-way tie in the 5/6 Year Old YJC Qualifying Class, with six horses each posting a clean effort. Candice King and Dimitri, Paul Halpern and Lucy, King and Astakkato, Emily Dougherty and Vivaldi, Josh Dolan and Cora, and Carly Campbell-Cooper with Pandora split the earnings. Segal currently sits in the second place position for the Wellington Turf Tour Leading Rider Bonus. She is a mere $8,000 behind Welles, and this Saturday’s 1.40m Invitational Grand Prix Finale will tell all as the competitors enter into a heated battle of the best. The winner of the $24,950 Finale event will walk away with $8,000, also possibly claiming the coveted Leading Rider Bonus. The Leading Rider of the 2014 Wellington Turf Tour will receive a one-year membership to the International Polo Club Palm Beach, valued at $35,000. Each winner of the $15,000 1.40m Grand Prix for Week 8 -11 of the Wellington Turf Tour will receive an exclusive Ridge at Wellington saddle pad, and the victor of the $24,950 Grand Prix Finale will take home a PoloGear Branding Package including the saddle pad, a hat, one-of-a-kind polo shirt and a championship 2014 The Ridge at Wellington Turf Tour jacket to commemorate the series. The final week of competition is sure to be filled with top-tier competitors and horses, unparalleled hospitality and unrivaled footing. Beverley Bryant, of Bryant Portraits, will be on site for the finale event. Her artwork has been seen throughout the 11-week series, with magnificent portraits on display at the varying venues each week. The rider in second place for the series rankings will receive a one-of-a-kind horse head drawing by Bryant. Meadowbrook Horse Transport will provide transportation to and from the horse show and other locations throughout Wellington for both the Wednesday and Saturday events. The transportation is a nominal fee of $50 per horse, and will be calculated into the final show fees. To make a reservation for one of the three pickup times, 8 a.m., 11 a.m. and 2 p.m., please call Peter Tufano of Meadowbrook Horse Transport at (954) 415-7217, or call Nona Garson at (908) 500-0996. The events will run from 8 a.m. to 4:30 p.m. Riders are encouraged to get their entries in as soon as possible for the approaching $24,995 Grand Prix Finale. Turning in entries early will ensure that they get the time that they desire. Chloe Field and Luxtria Van T Gelutt Z.
Wellington, FL – March 14, 2014 – At only 17 years old, Venezuela’s Emanuel Andrade has amassed a string of highly sought after victories across the western globe. Today, he added another notch to his belt with his win in the 2014 Wellington Turf Tour 1.40m Grand Prix victory held at Valiente Polo Club in Wellington, FL. Andrade piloted Walter 61 to the blazing time of 35.986 seconds to vault to the top of the ranks and seal his victory as one of only six double clear efforts. For Week 10 of the Wellington Turf Tour, Valiente Polo Club opened their gates for the first show jumping event to ever be held on their well-manicured fields. Valiente, the 2013 U.S. Open runner-up, is one of the top polo teams at the International Polo Club Palm Beach (IPC) this season, with an amazing roster of riders including 10-goaler Adolfo Cambiaso, ranked No. 1 in the world; Santi Torres; and Sapo Caset. The polo team is owned by Denver businessman Robert Jornayvaz, and has shown nothing short of success in the realm of polo, recently winning the 26-goal C. V. Whitney Cup, and currently competing in the USPA Piaget Gold Cup at IPC. Valiente has become increasingly more involved with the community, not only opening their facility up for the 2014 Ridge at Wellington Turf Tour, but also hosting a polo tournament for kids that had well over 70 children in attendance. The morning was alive with excitement as the top riders in the nation gathered on the stadium field at Valiente Polo Club. The course tested both horse and rider alike, seeing only 15 ride to the jump off round. Throughout the course of the day The Wellington Turf Tour saw 41 horse and rider combinations, but Eric Hasbrouck designed a technical track for the penultimate week of the series. Emanuel Camilli, of Norfield Stables LLC, was the first rider of the day to traverse the track and move into the short course. He took a conservative approach with Rogue de la Rouche, riding to a clean effort in 46.899 seconds. Young talent Chloe Fields was the first to jet around the jump off, clearing each obstacle in a timely pace of 38.173 seconds. She continued to hold the lead, with Sarah Segal and Tilghman slipping in just behind in 38.322 seconds. Pablo Barrios was the first to blow Fields’ time out of the water, blazing through the course in 37.317 seconds. He kept a strong gallop from start to finish, shaving the seconds as he consumed the open distances with the 9-year-old gelding Ambosell. Although it seemed that Barrios had the win, Emanuel Andrade soon added his name to the jump off roster. Guiding Walter 61, Andrade erupted into a gallop like a bat out of hell, taking aim at the top time. He had seen Barrios post his remarkable round, and followed a similar path, but at a much more accelerated pace. He made a dash for the cash in a time of 35.986 seconds, more than a second ahead of Barrios. Andrade claimed the victory with no others able to touch his time. Barrios was awarded the second place, while Fields finished third. Segal captured the fourth place with Tilghman, while Oliver McCarthy navigated Ramses du Lavillon to the fifth place. Camilli rounded out the top six as the last of the double clear efforts. The final week of the Ridge at Wellington Turf Tour will conclude at the prestigious Deeridge Farms. This event is one of the highlights of Wellington’s winter circuit with $4,000 up for grabs on Wednesday, March 19, in the 1.30m-1.35m Jumpers, and qualifying points at stake in the Young Jumper Championship (YJC) Division with three times as much prize money on the table. On Saturday, March 22, the $24,995 Wellington Turf Tour 1.40m Invitational Grand Prix Finale will take center stage with an unprecedented amount of money at stake for Level II Jumpers. Jeffery Welles continues to sit on top of the Wellington Turf Tour Leading Rider Bonus standings with $17,705 earned throughout the series. Ireland’s David Blake sits in second place with $10,825. Although Welles has what appears to be an insurmountable lead, next week’s finale event will tell all. The winner of the finale event will walk away with $8,000, possibly also claiming the coveted Leading Rider Bonus. Wellington, FL – March 13, 2014 – Jeffery Welles is leaving nothing to chance as he continues to capture the top wins with each passing week during the Ridge at Wellington Turf Tour. Although he took a break with his top mounts for Week 9 of the series, he returned for the tenth week of competition with his eyes set firmly on the win. Welles rode to the top of the 1.30m-1.35m leader board for both the red and green classes held at Valiente Farms yesterday, keeping the stronghold on the Leading Rider Bonus. Molly Ashe Cawley was the first rider of the day to lay down the time to beat in the red class with Cocq A Doodle, a young bay mare who has sat at the top of the ranks consistently throughout the Wellington Turf Tour. Her impressive double clear in 44.960 seconds vaulted the duo to the top of the ranks, but their reign was short lived as fellow Norfield trainer, Emanuel Camilli rode Emma Peel 40 to a speedy clear round in 43.704 seconds. Karina Aziz and Chacco’s Goldie slid just behind Camilli with a clean jump off in 44.518 seconds. Week 10 saw over 40 entries, but Jeffery Welles took over the lead in the red course with Bilion, becoming the day’s trailblazer as he rode the talented horse to a time of 39.747 seconds, pushing Camilli into second place. Welles continued his hot streak into the second class of the day with Gummi Van Oz. They tackled the shortened track in a speedy 39.685 seconds, more than four seconds ahead of his fellow contenders. Candice King and Balous Day Date rode to the second place finish with a clear round in 44.153 seconds. Kevin Babington and Borindy took the third place, while Monica Carrera and Lincourt Gino finished fourth. Emily D’Alessandro and Tarantel’la took home fifth, while Derek Braun and Cojack rounded out the top six. Welles continues to lead the Wellington Turf Tour Leading Rider Bonus standings with $17,705 earned throughout the series. Ireland’s David Blake sits in second place with $10,825. Although Welles has what appears to be an insurmountable lead, this Friday’s 1.40m Grand Prix and the following week’s finale event will tell all. The winner of the finale event will walk away with $8,000, possibly also claiming the coveted Leading Rider Bonus. Tomorrow the 1.40m Grand Prix will return to Valiente Farms for the final week of competition before the finale event at Deeridge Farms on March 22, 2014. The course will open at 8 a.m. and remain open until 4:30 p.m., allowing competitors ample time to come at their convenience to ride and enjoy the ambiance of Valiente. The 11-week series will culminate with the $24,750 Wellington Turf Tour Invitational Grand Prix Finale next Saturday at Deeridge Farms. Attendees of Week 10 of the 11-week series can look forward to a show filled with top-tier competitors and horses, and nearly $200,000 in prize money. Meadowbrook Horse Transport will provide transportation to and from the horse show and other locations throughout Wellington for both the Wednesday and Friday events. The transportation is a nominal fee of $50 per horse, and will be calculated into the final show fees. To make a reservation for one of the three pickup times: 8 a.m., 11 a.m. and 2 p.m., please call Peter Tufano of Meadowbrook Horse Transport at (954) 415-7217, or call Nona Garson at (908) 500-0996. Visit www.shownet.biz for full results and videos. 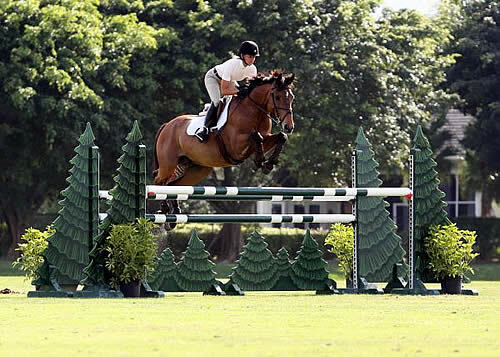 Stephen Barcha and Ad Jacpote rode to the top of the Wellington Turf Tour $15,000 1.40m Grand Prix leader board. Photo by Kendall Bierer/Phelps Media Group. 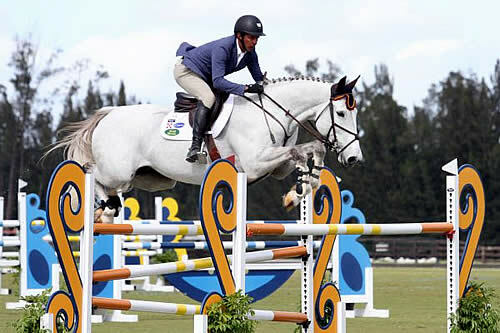 Wellington, FL – March 7, 2014 – Sometimes it can be hard for young riders to find backers, but famed equestrian Nelson Pessoa was happy to step up to the plate with 23-year-old Stephen Barcha. The talented Brazilian rode Ad Jacpote to the first place finish in the Wellington Turf Tour 1.40m Grand Prix at the International Polo Club Palm Beach. They swept away the competition with a brilliant jump off in 34.115 seconds. Out of a field of 50 riders, only 12 were able to traverse the short course and ride to a double clear effort. Brazil was heating up throughout the day with Rodrigo Pessoa paving the trail in 38.258 seconds with Tinkabell. Judy Garafalo Torres and Qualtro Queen slid ahead for a moment with their time of 38.103 seconds, but their reign was short lived as Darrin Dilin set time to beat with Martha Louise, owned by Susan Grange. Dilin rode to the speedy time of 37.168 seconds, while also riding second mount Ariana to a double clear time of 38.890. It was Joao Castro, a rider for Nelson Pessoa, who took over the pinnacle of the rankings with Quarelly. They finessed the track in a speedy 37.040 seconds-but it wouldn’t hold with over 30 riders remaining. Charlie Jacobs and Leap of Joy cleared the first round and entered into the jump off with their eye on the prize. They navigated the serpentine of obstacles in a timely 35.697 seconds, more than a second ahead of Castro. It seemed as though they grasped the victory, but Nelson Pessoa had a secret weapon waiting at the in gate. Stephen Barcha tore around the short track at an unbelievable pace, guiding Ad Jacpote, owned by Nelson Pessoa, through each turn and shaving the seconds. Jacobs had made the mistake of adding a stride to the final combination of the jump off, and Barcha used it to his advantage. With a large stride Barcha and Ad Jacpote consumed the turf and crossed the timers in 34.115 seconds. Their time would stand as no other contender could catch them. Barcha has been riding the 10-year-old stallion for the last year, and together that have worked to try to accomplish his dream of competing at the World Equestrian Games. “Ad Jacpote is a good stallion; he is not too much in his head. He is brave, and is totally different stallion than any I have ever ridden in my life. Sometimes he is a little slow, and I think this type of class is very good for him so I can work with him on short turns. These types of shows also help me to prepare for the big classes,” Barcha commented. Nelson stood proudly ringside as he discussed the round with Barcha. Week X of The Ridge at Wellington Turf Tour will be held at the spectacular Valiente Polo facility in the Wellington Preserve. This Wednesday and Friday will mark the first time the prestigious venue will open its gates for show jumping. Get your entries in now for the 1.30m-1.35m Jumper classes to be held on Wednesday, March 12, as well as the $15,000 Ridge at Wellington Grand Prix on Friday, March 14. Riders should get their entries in to avoid post-entry fees. The stakes are increasing each week as top riders, amateur and professional, vie for their invitation into the $24,750 Invitational Grand Prix Series Finale Saturday, March 22, 2014. The Wednesday and Friday events will run from 8 a.m. to 4:00 p.m. Riders are encouraged to get their entries in as soon as possible for the approaching events. Turning in entries early will ensure that they get the time that they desire. 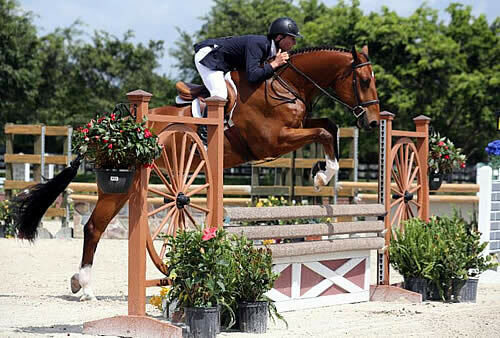 Wellington, FL – March 3, 2014 – The ninth week of the Ridge at Wellington series is here! This week’s events will take place this Wednesday, March 5, and Friday, March 7, 2014, at the International Polo Club Palm Beach (IPC). This event is one of the highlights of Wellington’s winter circuit with $4,000 up for grabs this Wednesday in the 1.30m-1.35m Jumpers, and qualifying points at stake in the Young Jumper Championship Division. 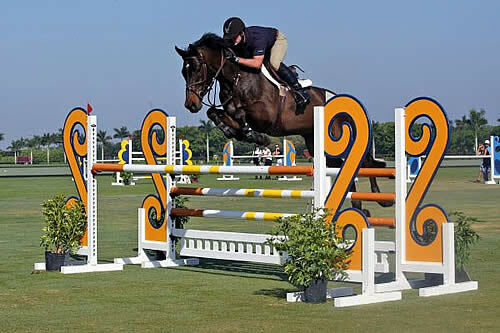 This Saturday the $15,000 Wellington Turf Tour 1.40m Grand Prix will take center stage at IPC with an unprecedented amount of money at stake for Level II Jumpers. Wednesday marks the third of five opportunities The Ridge at Wellington will offer this season for riders to compete in the Young Jumper Championship (YJC) qualifying classes for essential points. This week’s riders in the Young Jumper classes will compete on the turf at IPC with their up-and-coming jumpers, giving them an opportunity to expose their young horses to different show conditions and locations. From 8 a.m. until 10:30 a.m. riders will have the opportunity to rack of points in the $500 5 Year Old Jumper YJC Qualifying Class. The $500 6 Year Old YJC Qualifying Class will run from 11 a.m. – 1:30 p.m. The $500 7 and 8 Year Old YJC Qualifying Class will take place from 2 p.m. – 4:30 p.m. Riders will have the chance to partake in a warm up round with an open card in order to prepare for the qualifying classes. The 1.30m-1.35m Jumper classes will continue to run on the grass field at IPC, with the classes running concurrently. Currently Jeffery Welles sit on the top of the ranks for the Leading Rider Bonus, sweeping Week VIII of the series will Bilion. The 1.40m Grand Prix will once again leave its mark at IPC this Friday, March 7, 2014. Ireland’s David Blake slid into second place last week, and the competition continued to heat up. Who will ride to the challenge for Week VIIII? Attendees of Week VIIII of the 11-week series can look forward to a show filled with top-tier competitors and horses, and nearly $200,000 in prize money. The Ridge at Wellington Turf Tour was designed to develop young riders and young horses and provide a change of venue for all riders. The 2013 event was hailed as a highlight of the season with top riders, amateurs and juniors alike choosing to ride in the invitational series, challenging their young horses to a new experience during the Winter Equestrian Festival. The 2014 series returned to the Wellington show scene bigger and better than ever. The event is approaching quickly, so riders should get their entries in to avoid post-entry fees. The stakes are increasing each week as top riders, amateur and professional, vie for their invitation into the $24,750 Invitational Grand Prix Series Finale Saturday, March 22, 2014, and the Leading Rider Bonus. The events will run from 8 a.m. to 4:30 p.m. Riders are encouraged to get their entries in as soon as possible for the approaching $15,000 Friday Grand Prix. Turning in entries early will ensure that they get the time that they desire. Jeffery Welles and Bilion. Photos by Kendall Bierer/Phelps Media Group. Wellington, FL – February 28, 2014 – Jeffery Welles proved untouchable today at the International Polo Club Palm Beach. Speed was the name of the game as Welles topped the Wellington Turf Tour 1.40 Grand Prix leader board with a double clear round in 35.891 seconds aboard Bilion. Sweden’s Daniel Zetterman claimed the second place falling only 4/10ths off Welles’ pace. David Blake took the third place finish in a speedy 36.700 seconds with Aischa. Eric Hasbrouck designed Week VII’s course, utilizing a liverpool, technical lines, unrelated distances, a triple combination and a double combination. Fourteen riders found their way through the first course without fault, but only nine were able to ride to a double clear effort. Reed Kessler and Cylana were the first to navigate the track and continue into the jump off. They had a heart breaking rail at the final fence for four faults, but Ali Wolff and Caya were right on their trail. The pair was the first to ride to a clear jump off setting the pace with their time of 36.983 seconds. Debbie Stephens and Dryden also put in a double clear round; however, their time of 37.130 seconds would only prove good enough for the sixth place. Joe Fargis guided Lariat to the fifth place with his clean time of 37.099 seconds. It seemed as though Wolff would take the win, until the Wellington Turf Tour Series Leading Rider, Jeffery Welles, entered the ring aboard Bilion. From the first oxer to the final vertical, Welles kept an astonishing pace. Bilion turned easily from the second fence to the third of the jump off, and continued their brilliance with a slice from the skinny to the newly introduced oxer. It was their forward pace to the final obstacle that was the key, finishing in a time of 35.891 seconds. With 20 horses remaining, many riders still had their hopes set on surpassing Welles’ blazing effort – Daniel Zetterman (SWE) was one of them. Jolly Joker with Zetterman in the irons finessed the first round with ease, and continued into the jump off. Following a similar path to Welles, Zetterman was able to leave all of the fences intact, but 4/10ths of a second would cost him the first place finish. Ireland’s David Blake also tried to catch Welles’ speed aboard Aischa. 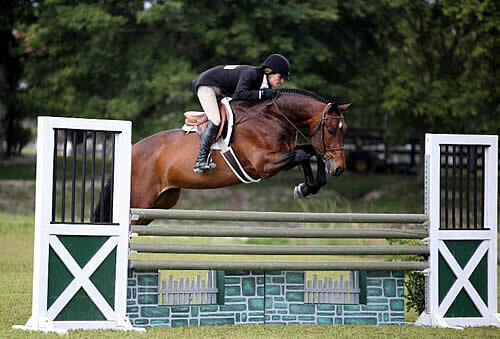 The 9-year-old mare has proven herself time and time again during the winter circuit, and Blake utilizes the Wellington Turf Tour to help her continue learning on the open grass field. Although they flew through the turns and rode to a clear effort, their time of 36.700 seconds would stand for third today. Week VIIII of The Ridge at Wellington Turf Tour will be held at the International Polo Club Palm Beach. Get your entries in now for the 1.30m-1.35m Jumper classes, Young Jumper Championship (YJC) Qualifier Classes, and the $15,000 Ridge at Wellington Grand Prix. With Welles taking over the leading rider position, the competition is getting fierce as only three weeks remain to claim the one-year membership to the International Polo Club Palm Beach! For more information, call (908) 500-0996 or download information at http://www.theridgefarm.com. Show Net is onsite for all Ridge at Wellington Turf Tour events, capturing footage and providing live results for each class. For full results and videos please visit: www.shownet.biz. Wellington, FL – February 26, 2014 – Jeffery Welles and Bilion soared through the timers in 30.010 seconds to capture the victory in the first 1.30m-1.35m Jumper class at the International Polo Club Palm Beach (IPC). Their skill through the short track allowed them to surpass 27 contenders and affirm their lead in the Leading Rider Bonus standings. Peter Leone and Alias rode to the first place finish in the second 1.30m-1.35m class, riding to the superior time of 31.488 seconds. Leslie Howard had set an early lead this morning as the fog lifted from the turf. As the first rider of the day, she left nothing to chance as she guided Whistler to the jump off time of 30.984 seconds. Her time held strong as each consecutive competitor attempted to catch her without avail. It seemed that she had the win in the palm of her hand until Welles traversed the track. Welles is no stranger to The Ridge at Wellington’s Turf Tour, claiming top placings already throughout the 11-week series. Welles was able to navigate Bilion to a quick and tidy jump off, besting 12 contenders to claim the blue in a time of 30.010 seconds, shaving the seconds with tight turns and utilizing speed. Howard’s time would prove good enough for the second place, with Monica Carrera and Lincourt Gino capturing third. Jennifer Gates and Cadence rode to the fourth place finish, while Eirin Bruheim and NLF Favorite took fifth. Amanda Hart and Precious Metal 3E rounded out the top six. It was Peter Leone who rode to the first place finish in the second class of the day. He entered into a 13-horse jump off to ride away with the win aboard Alias. He jumped to a double clear effort in 31.480 seconds. His student Kiva Iscol secured the second place aboard Casino Van De Helle in 31.667 with another clean jump off. Andrew Bournes and Casper rode to the third place with a clean effort in 32.502 seconds. The course opened at 8 a.m. and remained open until 4:30 p.m., allowing competitors ample time to come at their convenience to ride and enjoy the ambiance of the International Polo Club Palm Beach. The $175,000 1.40m Invitational Grand Prix event will return to IPC tomorrow for the eighth week of competition. The 11-week series will culminate with the $24,750 Wellington Turf Tour Invitational Grand Prix Finale on Saturday, March 22, 2014 at Deeridge Farms. 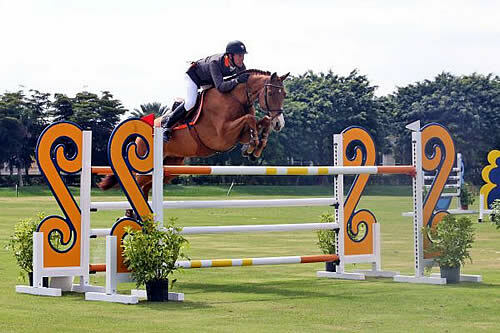 The Ridge at Wellington offers rated Equitation Shows every Tuesday from January – March 2013. There will also be a series of schooling shows at the Ridge at Wellington for all experience levels.